Sunrise has come a long way from its days as an email newsletter. Less than four months after launching its free calendar app on the iOS App Store, its founders — former designers from Foursquare — are announcing their first round of funding, totaling $2.2 million. The round was led by Resolute.VC and Next View Ventures, with additional participation from Lerer Ventures, SV Angel, Box Group, 500 Startups and Terrapinbale, all investors that Sunrise’s founders say understand their approach to putting product design first. Sunrise’s rise has come in a pretty short amount of time. 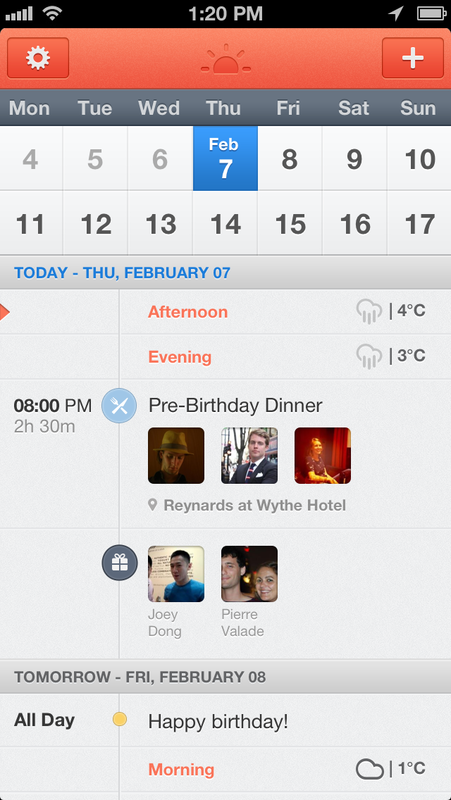 But who gives money to an iOS calendar app when every iPhone comes with Calendar built in? Investors who see the importance of using design to solve productivity problems. It’s the same reason why an iOS-only email app like Mailbox could be scooped up just months into its existence by Dropbox. The default Mail, Calendar, Weather and Contacts apps on the iPhone are very bare-bones and lots of developers are making progress improving them. The guys who started Sunrise are designers by trade: Pierre Valade and Jeremy LeVan helped design Foursquare before striking out on their own. Valade likes to say that they approach the mobile calendar as a “design problem, not an engineering problem” and that has informed how they’ve built Sunrise. As I demonstrated in my video review, the app can take your Google Calendar events and integrate them with data from Google Maps, Facebook, Skype, LinkedIn and weather info in a way that displays a lot of information without being overwhelming; it also has a really interesting and intuitive way of expanding and shrinking the view from day, week or month. We’ll be highlighting some of the most forward-thinking designs for mobile, the web, and connected devices at our annual RoadMap conference in November in San Francisco. Tickets will go on sale later this Summer, but you can sign up to be one of the first to access tickets here.